It’s that time of year again when I brew a gruit ale. Actually it’s rather delayed this year since I usually do it in December, but other things kept me busy. A little bit of history first. Gruit is a mixture of herbs used to flavor an ale that was in use before being gradually replaced by hops throughout Europe and varied from brewer to brewer. Hop use became more prevalent due to better antiseptic and keeping qualities, though there are other herbs traditionally used in gruit that have similar effects, as well as political and cultural issues. For example gruit vs hops played a role during the Reformation when people intentionally used hops instead so as to not give business to the Roman Catholic monasteries that were the main producers of gruit. Hops were also used for their soothing and calming qualities rather than stimulating and aphrodisiac ones of gruits that promoted behavior shunned by the Puritans. In Britain, herbal ales were called “ale” and those with hops were called “beer”, but that tradition did not survive to our days. There is some interesting history there, same as with every kind of beer in the world. In recent years a few breweries started experimenting with unhopped beers as did homebrewers. I have had a few commercial and homebrewed gruits and to be honest I find home made ones to be much more interesting and tasty. The commercial ones seem to be watery and just a tiny bit herbal so that it feels like one is drinking some carbonated herbal tea not to mention the complete lack of stimulating of aphrodisiac effects. The breweries probably play it safe since they have to invest a lot of money into each batch. 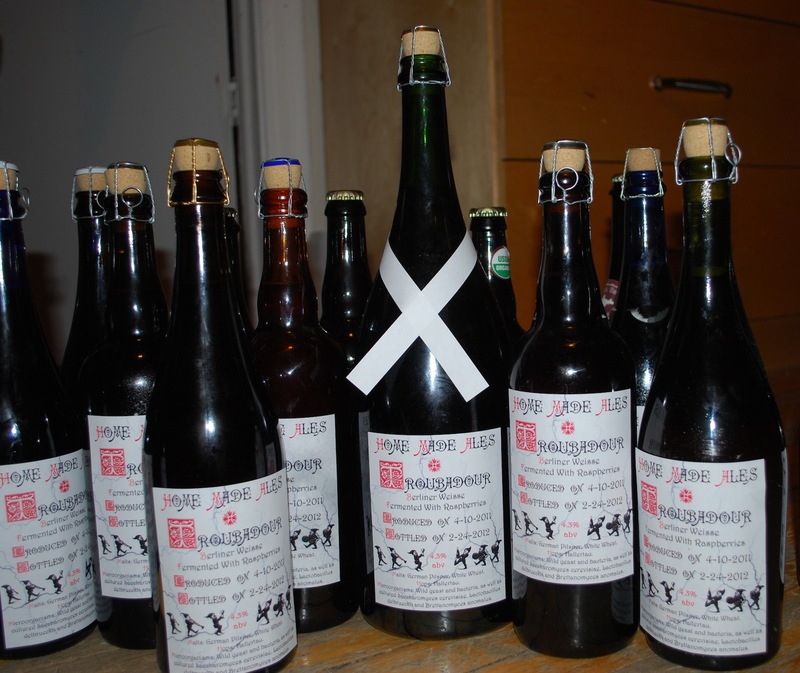 Homebrewers are free to experiment and go crazy as they wish, often with great results. I remember this one guy brought his creation to one homebrewer meeting and that was actually my first meeting with a herbal beer. It was thick, very herbal, very bretty, and very tasty. Hard to imagine all of these in one drink, but nonetheless that’s what I remember of it. Some time later I had the fortune of tasting TheMadFermentationist’s “Kvass/Gruit” and it completely blew my mind. Very clean, crisp, lactic, piny, smoky, just great any way you look at it. I liked how he tried to mix the two styles and actually ended up with great results. I prefer and make my Kvass light and very sour, but I’ll talk about that in the summer. My gruits are smoky, tart, and must have some evergreen character. For this reason I use juniper as a staple herb for these ales (though temptation to use spruce is very strong) and vary other components with every batch. This year, thanks to Valley Malt’s Malt of the Month, I have a ton of their 2-row (which is actually Marris Otter like), their cherry smoked malt, and their chocolate malt. So I decided to give it a try. Smoked and Chocolate malts are experimental for them and we are the lab rats who they’re trying them on so I had no idea what to expect. The smoked malt smells like you put pounds and pounds of hot ham into your mash. Very hammy, but not overpowering or unpleasant and slightly sweet. So much so that the whole apartment smells like ham long after brewing is done. Chocolate is also very nice and seems to behave like a pale chocolate malt based on the color it imparted. We won’t know for sure until the ale is ready to drink in a few months. This year I deviated from using rye and replaced it with oats. Also I’m not doing a “semi-wild” fermentation as before – just take some baker’s yeast from the jar and throw it in with whatever else lives in it besides yeast along with some fresh rye bread slices. With this batch I’m using Wyeast Farmhouse Ale strain and will add Brettanomyces bruxellensis and lambicus toward the end of fermentation to give it that funky twist. Some time this summer I came across a ton of juniper (one of hundreds of varieties of it) that the owner wanted trimmed down. I asked if I could have the parts they cut off and he didn’t seem to mind. After going through 2 large bags of twigs I picked out the best and greenest leafy parts, washed them, and froze for later use. I’m not sure exactly how much I got and didn’t measure the mass before brewing, but it’s for sure over 1 pound. For sake of the recipe let’s just call it 1 pound. 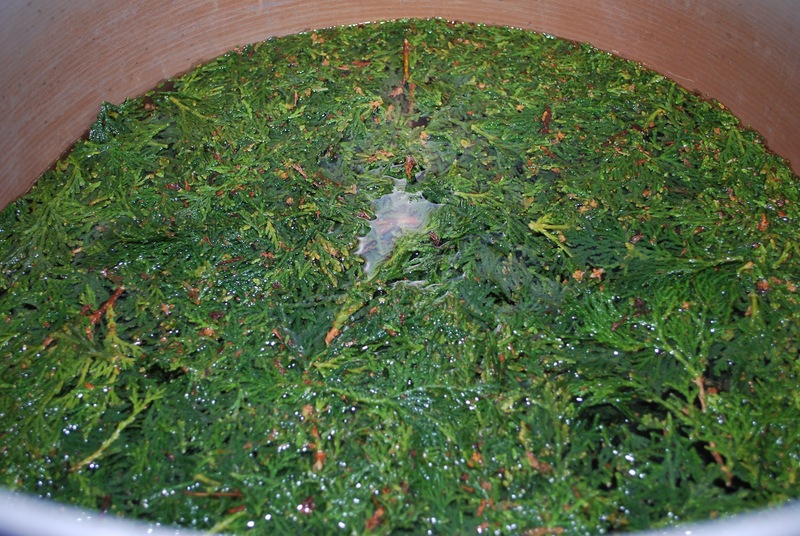 As the strike water was heating up the twigs went in it to defrost and give the mash more evergreen goodness. This gave the water greenish-yellow color. Everything went into the tun with the grain and the twigs actually helped with lautering because all those oats make it quite sticky. The downside to mashing with them was that it made the cleanup way harder than it usually is, but that’s just my setup specificity. I intentionally hardened up the water to play with the darkness of ale. Other than dismal efficiency and a couple of disasters along the way (seriously it’s as if everything that could have gone wrong today did so) it went well and, hopefully, the brew will come out well. Fermentation Temp: Start at 64 degF and let go where it wants to at room temperature. Boil for a while with the lid half closed to minimize evaporation, then remove it and let boil down to 5.5 gal before starting additions. Probably ~1.5-2 hour boil altogether. 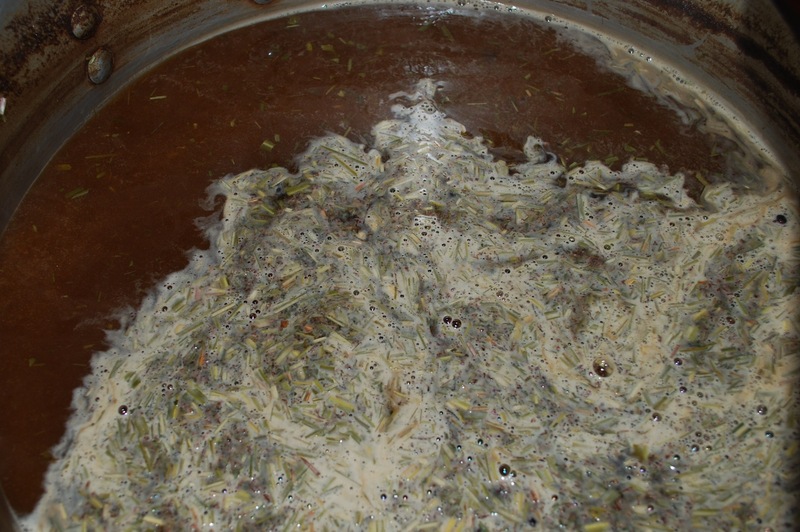 Interesting note: when I threw in the cut juniper berries (always used whole before) that thick sludge that you get floating on top as you start heating up the wort came back for a few minutes (not on picture). I wonder what reactions took place. About weird amounts of herbs. I just used up whatever herbs I had left, thus the inconsistency of amounts relative to each other. Having previously brewed with lemongrass and mint those amounts should be comparable with lemongrass possibly taking over. You guys should try making an American IPA with them. They fight for dominance in both aroma and flavor to the very end. It goes as far as smelling and tasting different from sip to sip. Very fun. I in no way imply that I’m a gruit authority or know what I’m talking about. These brews are made for my own tasting pleasure and I enjoy the results. If anyone knows more on the subject please share your knowledge! I also bottled the Raspberry Berliner Weisse today. FG is 1.000. The taste was very tart right from the start, giving way to raspberry and funk. Aroma was a constant carousel between funk, raspberry and something just plain weird. Can’t wait to taste it carbonated! pretty cool stuff. And pretty nice bottles for your Raspberry Berliner Weisse. I bottled my Berliner on the 22nd 🙂 What about the taste of your previous gruit made with baker’s yeast? Was there some sourness detectable? I am asking because I heard that there are some sort of Lactobacillus in our baker’s yeast here in Switzerland. Can’t tell if it is the same for your baker’s yeast in the States. A student at my University made bread with pure baker’s yeast (no Lactobacillus) and with the “infected” yeast. The bread experts favoured the bread made with the “infected” baker’s yeast. The Lactos in the baker’s yeast seem to improve the flavour of the bread in some way. Absolutely! Baker’s yeast results in a tart flavor which is actually quite pleasant in ales like that. I haven’t checked if there are indeed Lactobacillus species living there so I can’t be sure, but I have suspected that for a few years now. I have heard from another gruit brewer that even with pure yeast you still get tart character which is one of the reasons I’m initially trying this one with pure culture. I found a paper online where they took samples at various steps of production at a baker’s yeast plant in South Africa. If I recall they found lactobacilli at almost every step of the process. I don’t know how representative that one plant is, however. I’ll look for it in a bit. It’s definitely not a problem in bread making, though. As you said it’s actually preferable to have some lactic fermentation while the bread is rising. The technique is called a preferment, which apparently was developed after bakers switched en masse from sourdough starters to leftover yeast from breweries. It’s basically just a flour and water mix left to ferment on its own before being added to the final dough much like a sourdough starter would be. Changing the water/flour ratio affects the balance between yeast and bacteria and thus the flavor profile as well. I’ve made some of my best breads that way, at least before I had a healthy starter. I think even if there weren’t any lactobacilli in baker’s yeast there would be more than enough in the flour to do the job if left to ferment long enough. I recall the dominant species is Lb. plantarum, though there are tons of others in the mix. If you’ve ever tried to create a SD starter from scratch you will be familiar with the god-awful mix of foul-smelling bacteria present in the first few days. They eventually give way to the nicer-smelling species. Fortunately for us bread makers there are a few microbiologists interested in sourdough and bread baking since a few years ago to give the rest of us some insight into what’s going on.